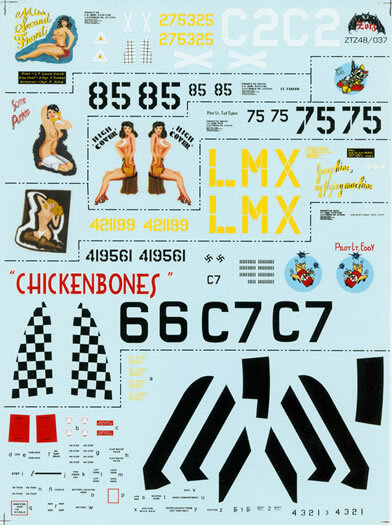 48/037 is the third of the four new 1/48 scale sheets from Zotz Decals covering colourful P-47 Thunderbolts. ‘Miss Second Front’, P-47D-11-RE serial number 42-75325 of the 395th Fighter Squadron, 368th Fighter Group. This machine was based in the European Theatre of operations and wore olive drab over neutral grey camouflage with the standard recognition markings consisting of a white cowling front and white bands on its vertical and horizontal stabilisers. It also wears the remnants of its D-Day markings on the undersides of its wings and fuselage. Its rudder trim tab is in white with what looks to be an unfinished chequerboard marking and its cowl flaps are alternative black and white. ‘CHICKENBONES’, P-47D-27 RE serial number 44-19561 flown by a Lieutenant Eddy of the 346th Fighter Squadron, 350th Fighter Group in the Mediterranean theatre (Italy) in early 1945. The machine is in natural metal finish with olive drab anti-glare panels (fore and aft the cockpit) with a chequered rudder and the name ‘CHICKENBONES’ in (large) red letters on the port fuselage. It also wears the squadron insignia on both sides of the fuselage as well as large squadron identification letters 6 C 7. ‘High Cover’, P-47N-2-RE of the 7th air force's 333 fighter squadron, 318th fighter group based on le Shima Island and flown by a Lieutenant Ted Sykes. The machine is in overall natural metal finish with olive drab anti-glare panels. The fin, rudder and horizontal stabiliser/elevator wear the bold yellow and black striped post June 1945 group markings. The black stripes of the group markings are provided as decals. The serial number given on the data block decal looks to be bogus to me as it is “14-87497” which was not worn by a P-47N. ‘Josephine/My Flying Machine’, P-47M-RE serial number 44-21199 of the 62nd Fighter Squadron 56th Fighter Group and flown by a Lieutenant Leo F, Bustie. Another European Theatre machine it wears a Squadron applied (and long debated!) camouflage scheme of Royal Air Force ocean grey and dark green over natural metal under surfaces and sports a red cowling front and a yellow rudder. ‘Some Punkins’, P-47N-1-RE serial number 44-87839 of the 73rd Fighter Squadron 318th Fighter Group on le Shima island. As with the other 318th Fighter Group machine above, this one is also in overall natural metal finish with olive drab anti-glare panels and wears the group’s yellow and black striped empennage. 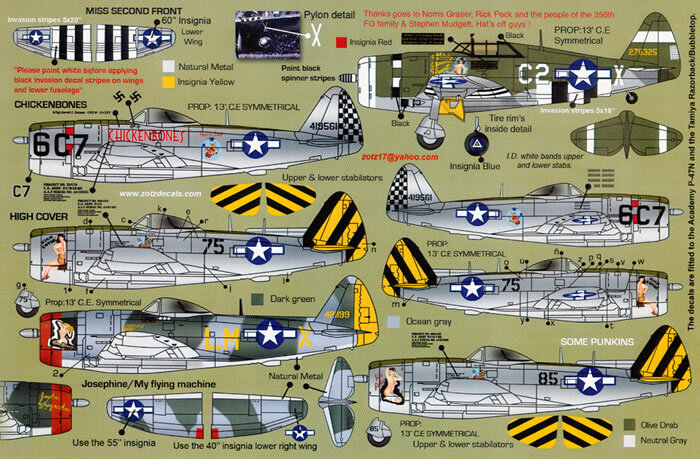 There is no advice as to who has produced the decals but they are really well printed with the nose art being rendered with shadowing and shading – very well done indeed. The decals are thinly printed and have an absolute minimum of film surrounding each individual item. You get a single set of national insignia (including two of the larger ones worn on the bottom of the port wing as an added identification marking in the European theatre) as well as a single set of stencil data. Each option has its own individual data block with the correct serial (except for the ‘High Cover’ option). 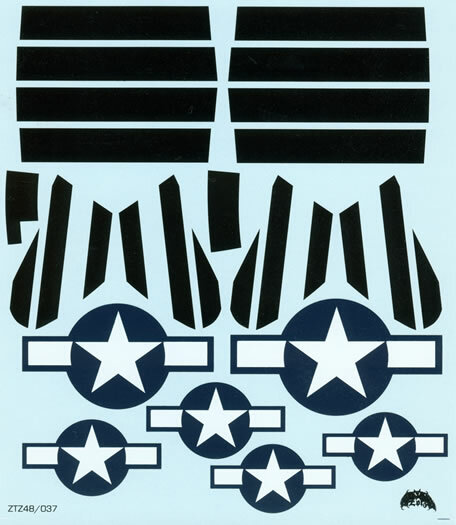 A single set of 318th Fighter Group tail markings is provided too as are a set of black-only D-Day stripes. The decals and the placement guides come packed in a clear plastic zip-loc bag. Zotz Decals has provided some really colourful good quality markings for five colourful machines on this sheet. However, I can’t help thinking that with this sheet as well as the other three sheets in the series, it would have been even better if more information of the subjects were provided.